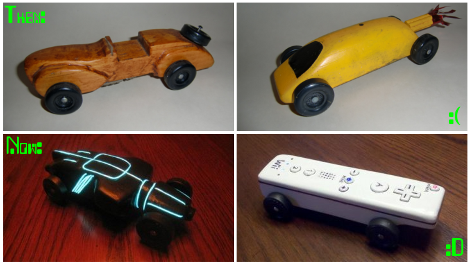 Get your graphite and hike a wheel, [Aron Hoekstra] writes in to completely embarrass us with some excellent pinewood derby cars. In the pursuit of that extra something [Aron] consulted with his sons who came up with some cool ideas for cars, one Tron themed and the other basically a Wiimote with wheels! The official Pinewood derby rules say nothing about electronics, so as long as nothing helps the block-o-wood travel down the track faster, anything goes. This means you are free to load up whatever cool lights you want, but will have to earn your robotics merit badge some other way. [Aron] Starts the builds by carving out the shape of the cars, each feature a hollowed out cavity underneath to accommodate the batteries and electronics. 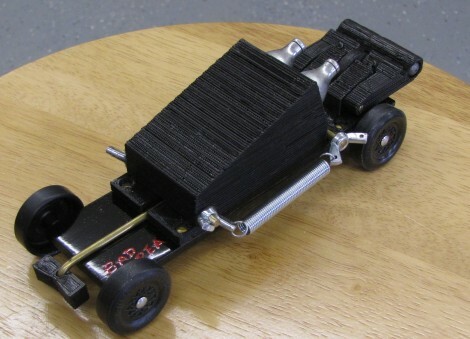 For the Tron Light Runner car, one continuous EL strip weaves in and out of the derby car’s body, and a single AAA battery runs the driver. [Aron] notes that it took around five feet of EL wire to cover the little car, which is two more than the driver is rated for. Fortunately the extra little bit of additional wire had little effect on its brightness. The Wiimote car has detailed 3d buttons, a breadboard with a linear regulator, and PIC 16F628 driving blue LEDs. For the majority of the time the PIC simply runs a chase routine for the four LEDs, but [Aron] went through the trouble to program in the Wiimote’s start-up sequence! Shown above the [Hokestra]’s work is my older brother’s pinewood derby car (top left) and my… potato rocket… thing… (top right) from many many years ago. I now seriously regret not considering LEDs! Although I think all that existed then was red, green and IR. Check out videos of the [Hoekstra] bros’ cars after the jump! The Pinewood Derby is a classic Cub Scout competition where dads and sons come together to build a small-scale race car. You start with a kit that includes a block of wood for the body, as well as four plastic wheels and four nails to act as axles. Most innovations in the ‘sport’ center around reducing friction between the wheels and the axles, and making the body as aerodynamic as possible. This year [Sliptronic] grabbed an extra kit and threw the rules out the window by powering the car with compressed carbon dioxide. He used a 3D printer to make a housing for two CO2 cartridges that mounts on the center of the chassis. An official Pinewood Derby race track is on an incline and has a wooden gate that keeps each car in place until it is dropped to start the race. [Sliptronic] is using this gate as the triggering mechanism. Springs on either side of the car pull against an arm at the back of the vehicle. This arm is held in place by a rod protruding out the front of the vehicle. When the start gate is dropped that rod releases the trigger, which is pulled up by the springs to pierce the CO2 cartridges. You can see an overview of how that mechanism works in the video after the break.